It’s often said that good things come to those who are willing to wait for them. It’s almost fitting, then, that the Calgary Flames and Mikael Backlund both remained patient and ended up getting what they ultimately wanted: a long term commitment. The Flames and Backlund have inked a six year contract extension worth an average annual value of $5.35 million. The deal will see Backlund remain with the team that drafted him through the 2023-24 season – when he’ll be 35 years old – making it extremely likely that the Swede will begin and end his National Hockey League career with the same franchise. Meanwhile, the Flames hold onto their most important center long-term. It’s a bit of a turnaround for a relationship that looked rather tenuous at various points along the way. The Flames originally selected Backlund in the first round of the 2007 NHL Draft. They traded down from 18th to 24th overall on draft day, gaining a third round pick in the swap, and selected Backlund from the Swedish junior system. At the time Backlund was playing with his hometown team, Vasteras in the Swedish secondary league, and a strong performance at the Under-18 World Championship in the spring helped elevated his draft stock after a season marred by injuries. At the time, Backlund was criticized for his defensive play and consistency issues, but praised for his hockey sense, skating and mobility. After signing with the Flames, he was eventually moved from Sweden to the Western Hockey League with the thought that the NHL club would be able to track his progress more directly. He went pro full-time beginning with the 2009-10 season, and began a sequence of fits and starts – progression and then regression. Starting out playing in the team’s bottom six under head coach Brent Sutter, Backlund began to work on his defensive game. He’d make improvements, and then he’d get injured or have a bad stretch of games. Eventually he began figuring out the offensive game as well, but then the injury bug would creep up again – famously he was to begin the 2011-12 season centering Jarome Iginla, only to suffer an injury in the final practice before the regular season began. It arguably wasn’t until the lockout-shortened 2012-13 season that Backlund showed that he had developed into a complete player. For a club that spent the better part of the 2000s trying to find a center skilled and fast enough to play with Iginla, waiting for Backlund to mature must have been agony. On the other hand, Backlund trekked from Sweden to first play in the WHL with the Kelowna Rockets, then to adjust to the often chaotic world of the American Hockey League. He worked to gain the favour and trust of a coach, only to see the coaching staff change before too long. And in a hockey world that constantly sees new general managers come into a front office and try to make their mark by sweeping out the “mistakes” of the previous regime, Backlund had to work hard to avoid finding a new home. Backlund played his entry-level contract for GM Darryl Sutter, putting up a solid-if-unspectacular 46 points over 137 NHL games. New GM Jay Feaster, likely trying to buy time to figure out what Backlund could be at the NHL level, signed him to a one year deal worth $725,000 – Backlund put up 16 points in a lockout-shortened season. He was rewarded by Feaster with a raise to $1.5 million and a two year contract. He scored 66 points over the next two seasons, slightly increasing his offensive output, but gradually being used in more of a shutdown role by new head coach Bob Hartley due to the emergence of Sean Monahan. Under his current contract, signed by Brad Treliving, Backlund has emerged as a full-fledged two-way threat – he had 134 points when his extension was signed, a sizable points-per-game jump. He finished fourth in Selke Trophy voting for the 2016-17 season. The Swedish center’s history in with the Flames has seen his role change as new coaches and GMs came in. He’s been yo-yoed up and down the line-up and even though he’s continually refined his offensive production and his defensive prowess, he’s been given successive “show me” contracts by the organization. His new contract has seen his patience pay off in spades. When the Flames drafted Backlund, they hoped he would become the center they always wanted and needed. He’s taken a bit longer to emerge than anyone probably anticipated, and his role is likely different than originally thought, but he’s performed a critical role as the club’s shut-down pivot over the past several seasons. 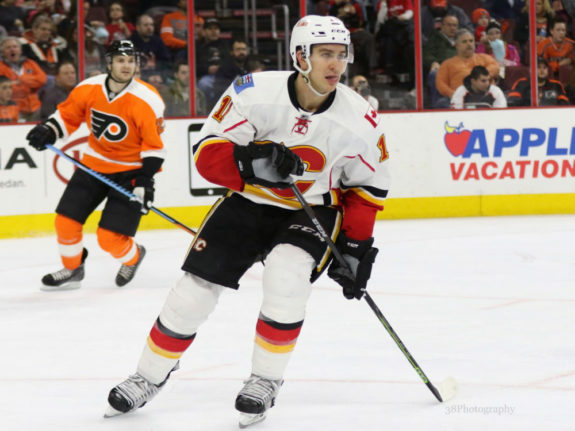 His new contract means that the Flames have their top two centers – Monahan and Backlund – signed through 2020-21, and they’ll be able to bring young third liner Mark Jankowski along slowly and guide his development with more sheltered minutes. It’s taken them quite a few years, but the Flames may finally have the center depth they’ve always dreamed of, and Backlund finally has a long-term commitment from the organization, too.